Every second counts in a medical emergency. That is why McLaren Northern Michigan is teaming up with northern Michigan Emergency Medical Services (EMS) to work together to remind the community the importance of using 9-1-1. The initiative started when McLaren Northern Michigan received a grant from Michigan’s Ongoing Stroke Registry to Accelerate Improvement of Care. 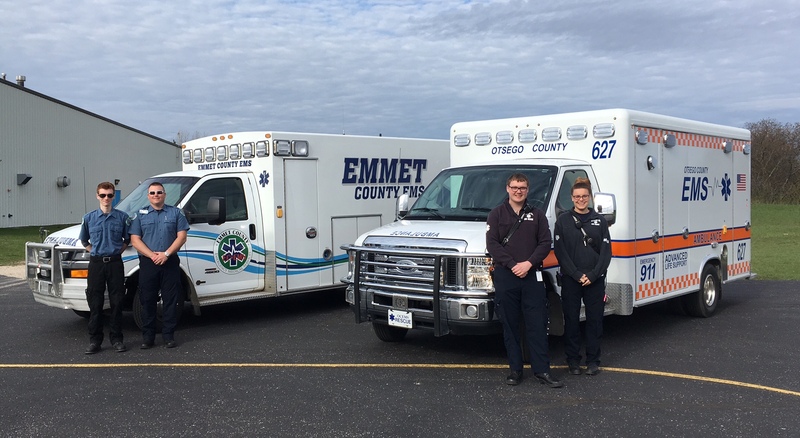 The grant funds Critical Care Classes for EMS which will enhance efforts in pre-hospital stroke care education, communication, and feedback. EMS teams participating in this course include Emmet, Otsego, Traverse City, Charlevoix, Alpena, and Cheboygan. With EMS equipped and able to handle emergencies such as stroke or heart attack, it is important for the community to understand the benefit of using 9-1-1 in a medical emergency and that EMS is more than just a ride. With May being National Stroke Awareness Month, McLaren Northern Michigan and area EMS teams want to answer common questions regarding the importance of 9-1-1 in an emergency. Why call 9-1-1 if you think you can drive yourself or have a loved one drive you? EMS can provide care and transportation that is faster and safer than driving yourself. EMS communicates with the hospital and physician before arriving at the emergency room. This allows the hospital to mobilize staff needed to treat the emergency and be ready the second you arrive. What are the benefits of calling 9-1-1 in an emergency? What are the risks of not calling 9-1-1? What are common questions EMS and medical professionals will ask? • When did you last see the person symptom free? What are the symptoms? • When did they begin? • Did the person receive an injury or fall recently? • Are you experiencing chest pain? • Are you short of breath? • What medications have been taken in last 24 hours? What to do while waiting for EMS? • Stay calm. Help is on the way. Call family. • Record name and birthdate. • Write down cell phone number of family. • Collect ID and health insurance cards. Knowing the warning signs of a heart attack and stroke can save a life. Remember that calling 9-1-1 starts care sooner. Balance - Loss of balance or coordination. Difficulty walking or using one hand? Eyes – Ask if sudden vision changes, double vision or unable to see off to one side? Face – Ask person to smile. Does face look uneven? Arms – Ask person to hold arms out. Does one arm drift down? Unable to move arm? Speech – Ask person to repeat a simple phrase. Does speech sound slurred? Does person use wrong word? Time – Call 9-1-1 if you exhibit one or more of these signs. Some heart attacks are sudden and intense and others start slowly, with mild pain or discomfort.